If you struggle with hair loss, you may have considered undergoing a hair transplant procedure. Although these procedures are consistently successful and life-changing for patients who have pursued this option, there are many false notions attached to hair transplants. These myths have prevented men and women struggling with hair loss and baldness from seeking a remarkable solution. In this post, we will debunk some of the most prevalent hair transplant myths to help you separate fact from fiction and make an informed decision. This very common myth misinforms many elderly patients, leading to avoidance of treatment. It has no scientific basis, and age has no link with hair transplant procedures. However, under the age of 21 it may be a good idea to wait a while after your initial balding occurs. Hair loss patterns are unpredictable and can continue after a transplant. You may experience a better chance for a successful hair transplant if you wait until you’re slightly older. This myth has led many women to simply accept hair loss because they don’t believe any viable solution exists. The reality is that the hair transplant procedure can treat both male and female pattern baldness. There are differences, however, as women tend to lose their hair in a different pattern than men and tend to have a sparser donor area. Similar to normal hair growth, hair transplants do not grow overnight. After the procedure, some hair may fall out during what we call the “sleeping phase” or “shock phase.” However, the well-anchored roots will gradually begin to grow hair, which should blend in perfectly and provide natural-looking results. In general, individuals can expect to see cosmetically significant results in as early as five months. The new hair will continue to thicken up to about a year and a half after which it should stabilize. At Feller & Bloxham Hair Transplantation, we take pride in the immense care our doctors bring to each hair transplant procedure. We use truly advanced, and consistently proven techniques to produce successful outcomes. Once your new hair grows in, it should blend seamlessly your existing hair. Hundreds of before and after photos show the incredible results you can expect. Shampooing and washing your scalp will not affect the growth of your new hair, and it can be done the day after your procedure. Contrary to this popular myth, cleaning the treated area as directed by the doctor is not harmful. Transplanted hairs are permanent, and you won’t have to do anything special after the procedure to assist hair growth. That means no special medication, shampoos or ointments are needed. If, however, you have used such medications in the past with success you will likely be encouraged to keep doing so for the sake of the surrounding non-transplanted hairs. But again, hair transplants do not need anything to help them initially grow or continue to grow. Both these assumptions are not accurate. When you receive a hair transplant, you will not obtain it from someone else. In fact, your body would reject foreign donor hair follicles. Body hair may be used to help augment scalp hair but this is not routine and it is performed only in extremely rare circumstance. At Feller and Bloxham we do not recommend the routine use of body hair to cover bald scalp. There are many reasons for this: body hair does not match head hair, the growth rate of body hair transplants is less than 50%, and they cause more cyst and scar formation. The only follicles normally transplanted during surgical hair restoration procedures are hair roots that exist in abundance on the back and sides of your head. During your hair transplant procedure some are removed and re-implanted into the balding and thinning areas of your hairline and the top of your scalp. Lasers were briefly experimented with during the early 2,000’s to help in making recipient- sites but were quickly abandoned because they inflicted too much damage to surrounding tissue and caused the transplanted hairs to grow poorly- if at all. These lasers should not be confused with Low Light Laser Therapy devices being sold now in the form of combs, brushes, and hats. Despite aggressive marketing campaigns these gadgets have no clinical usefulness and are not recommended by Feller and Bloxham Medical. Our hair restoration services are only skin deep. This form of surgery involves the only the skin of your scalp and does not penetrate the surface. The procedure does not come close to contact with any part of the brain and thus cannot impact it in any way. 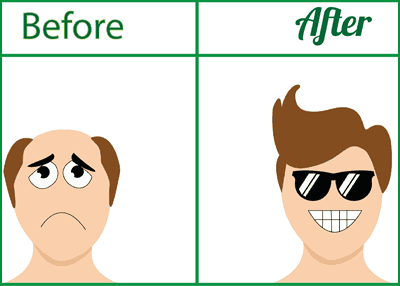 A few variables affect the cost of a hair transplant, such as the number of grafts needed. At Feller & Bloxham Medical, our prices are typically lower than those found in the city. We can offer this advantage because we are located in Great Neck and don’t pay exorbitant NYC real estate costs and taxes. We pass these savings directly to you. The procedure may be confusing when simply discussed or read about. View our YouTube video channel to not only see results of hair transplant surgery, but videos where the doctors actually show and discuss what they do as they do it. When you meet with one of our top hair restoration surgeons, they will take the time to answer your questions and offer reassurance for common hair transplant misconceptions. Contact us online to schedule your consultation, or call us at (516) 487-3797.